Anthony Mundine claimed the WBA interim world light middleweight title in a unanimous points decision over Rigoberto Alvarez in Newcastle last night. In a fight that could have ended his career had he lost, Mundine was far too hungry, coming out strongly before using his quick left jab to take control of the fight. Two judges had 'The Man' winning comfortably 1117-111 while the third scored a tighter fight, 114-113. But what was clear was with a host of NRL stars in his corner, Mundine's influence on the fight increased as the rounds ticked over and his Mexican opponent tired. The former rugby league star soon got on top in the bout using the power of his right hand to attack a wound above Alvarez's left eye which opened up during a barrage of blows in the fourth round. From the beginning it was Mundine who came out firing, claiming honours in the first round before Alvarez awoke and fired back with a series of body blows to take the second. 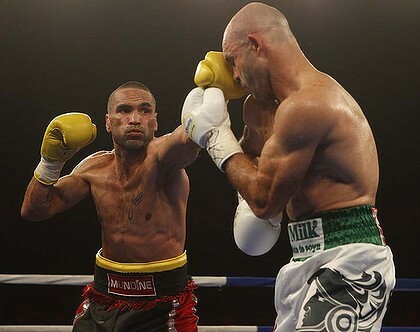 It only served to spur Mundine on with the cocky Australian mixing speed and power to earn the judges' respect in rounds three, four and five. Alvarez momentarily wrested back momentum in the sixth but it was Mundine who came home the more powerful. "I produced something a lot of people didn't think I could," Mundine said after the fight. "Sorry there wasn't a knockout. I was going for it." Next on the agenda for Mundine will be a potential world title fight with Austin Trout. "Bring on that sucker. He was talking crap about me, saying this, saying that ... so bring it on Austin," Mundine said. Among those in Mundine's camp were Australian Test star Greg Inglis, Newcastle signings Timana Tahu and Kade Snowden as well as Manly's George Rose.